1. 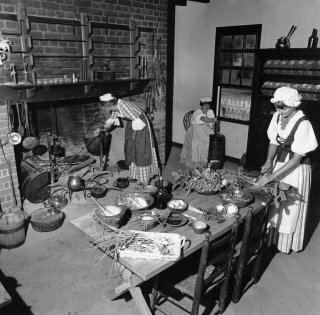 Back then, people had to eat 5,000 calories a day because of all this hard work reconstituting dried apples and plowing and planting and weaving and praying hard and penning tracts against Mother England. 2. Deforestation was so intense that log cabins were impossible to make and most houses had only clapboard. Very very cold. 3. If you had a couple cows you could keep a pig because the pigs ate cheese by-products. Who knew? 1. You learn not to back into a fire. 2. The tight, long aprons push your skirt backwards when you bent over an open fire. 3. Natural fibers are less flammable. 4. They dressed little children in raw wool that had lanolin oils resistant to flames. I had been worried about Irma getting burned while cooking over her open fires. As my sister would say, I can take this off my worry list.